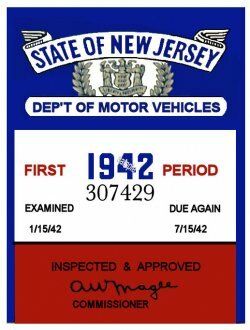 1942 1st Period New Jersey Inspection Sticker - $20.00 : Bob Hoyts Classic Inspection Stickers, Add a Final Touch to your Restoration! This 1942 FIRST PERIOD sticker was restored and reproduced identical to the original both front and back. The originl was issued in the First half of the year and expired in six months. For an additional $10.00 your own License plate number can be added to this sticker by replacing the serial number directly under the date with your QQ plate number. The original had both the expiration date and the owners license plate.